With heavy hearts, the family of Muhammad Latif announces his demise on December 9, 2017, in Lahore, Pakistan. He was buried in Mian Mir Graveyard in the presence of thousands of mourners. He was 90 and left behind a widow, three sons, two daughters and several friends. He was a loving grandfather, father and caring husband. 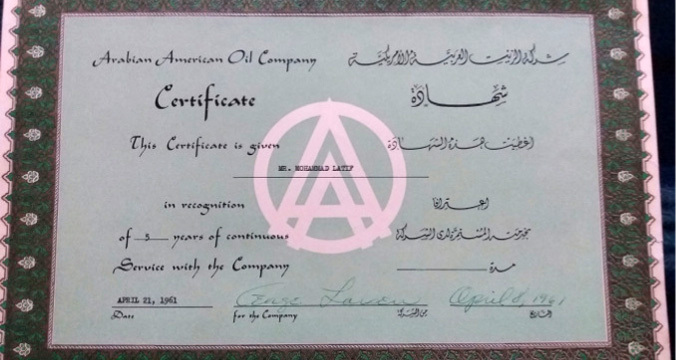 Muhammad worked for Aramco from 1956 - 1961. He worked in Abqaiq and Khobar under supervisors like J. T. Robinson and colleagues like Raja Ansari. The family asks that you remember Muhammad in your prayers. Condolences may be sent to son, Abid Latif, at [email protected].